Hello, dear friend! Thanks for stopping by today. I hope you're having a spectacular one! Lynn, technique challenge hostess on Splitcoaststampers, issued a challenge to make a wiper card this past Monday. I was intrigued by the idea of a wiper card, so gave it a try. 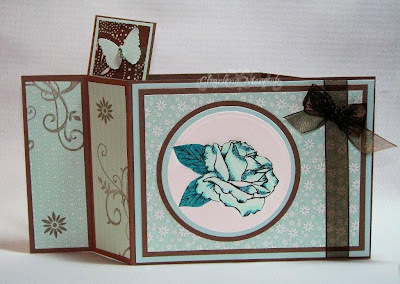 The flower is from A Year of Flowers available at Gina K Designs, and the cocoa flourish is from Stampin' Up's Baroque Motifs. I used Soft Sky and Close to Cocoa as my color choices. The designer paper is Soft Sky. I colored the flower with Copic markers and added just a touch of Cosmo glitter to parts of the leaves. The ribbon is a sheer chocolate organdy ribbon. Beautiful! Oh I love the colors, rose and your coloring. Just beautiful Charlene. This is just so pretty, Charlene!! Your flower is perfectly colored!! Love how the butterfly pops up too! Charlene, this card is beautiful!! the colors are wonderful, and that rose is gorgeous!! TFS! wow charlene! this is gorgeous and your coloring is like jaw-dropping! i love it!!!!! WOW! This is fabulous!! I have not tried this technique yet. Guess I need too! oooh pretty, Charlene...did you like the way the wiper card folds and the look of it when you were done? Haven't tried it yet, but it looks pretty fun!! Yours is just gorgeous, Charlene...I started one yesterday and just couldn't get into it. Your beautiful creation may get me inspired yet! Beautiful card, Charlene. Your coloring is gorgeous!